Physical therapists from as far away as Israel gathered Jan. 20-21 at the College of Health and Public Affairs for the first global summit of the mobility project known as Go Baby Go! Joining the group was Professor Cole Galloway from the University of Delaware, who founded Go Baby Go! to develop new and inexpensive ways for individuals with mobility impairments to explore their world. The project’s innovations include modified ride-on cars for young children and harness systems for children and adults. Go Baby Go! has grown to include more than 60 chapters around the world. Among them is the UCF Go Baby Go! chapter led by Jennifer Tucker, associate lecturer of physical therapy. The summit offered Go Baby Go! chapters an opportunity to reflect and plan ahead. Attending the summit were representatives from Go Baby Go! chapters at UCF; Cleveland State University in Ohio; the University of North Florida in Jacksonville; Washington State University in Pullman; Oregon State University in Corvallis; Rockhurst University in Kansas City, Mo. ; Marymount University in Arlington, Va.; and Tel Aviv University in Tel Aviv, Israel. Galloway followed with a state-of-the-project address to the group. He described Go Baby Go!’s reach, which now includes 50 hands-on workshops, more than 6,000 modified ride-on cars, more than 10,000 Facebook followers, a TED talk and an exhibit at the Smithsonian Institution in Washington, D.C.
Later Galloway and the participants discussed strategies to seize opportunities and address challenges in the future. They also participated in a brain-storming session complete with white boards and colored markers. 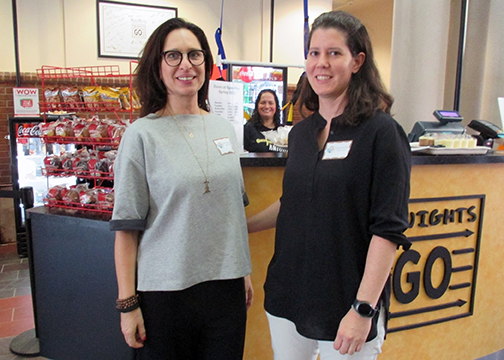 The summit provided an opportunity to showcase the college’s Knights on the Go Cafe, which features a Go Baby Go! harness system for adults with mobility impairments. Tel Aviv University physical therapist Nilly Waiserberg was among those who watched client Diana Tafur move around the food and beverage kiosk with support from the harness system. Waiserberg was pleased to see the system in operation and would like to implement it in her country. She started a Go Baby Go! chapter in Tel Aviv a year and a half ago and initially focused on building modified ride-on cars for children with impaired mobility.